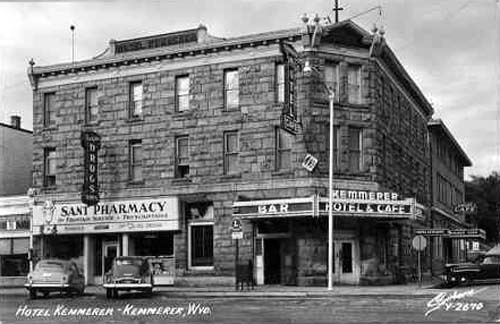 This Page: Kemmerer continued from previous page, the Kemmerer Hotel. 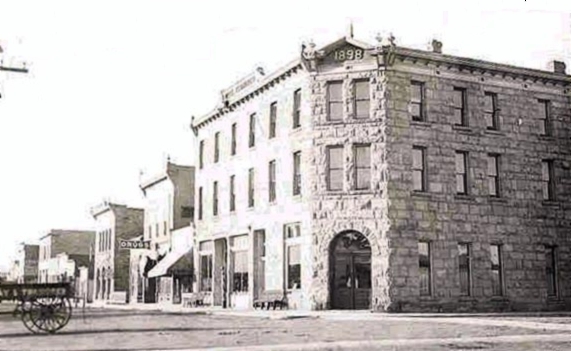 The Kemmerer Hotel, on the corner of Pine and Saphire, was constructed in 1897-1898 from stone quarried at Oakley. 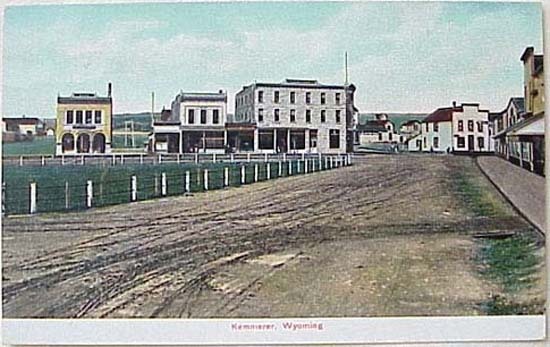 Kemmerer Hotel, looking to intersection of Pine and Saphire approx. 1910. 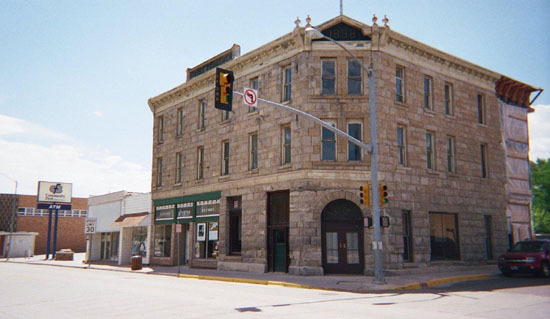 The hotel hosted business and social meetings of customers and employees of the Kemmerer Coal Company and hosted the very first organizational meeting of the Town Council upon the incorporation of the town, February 28, 1899. 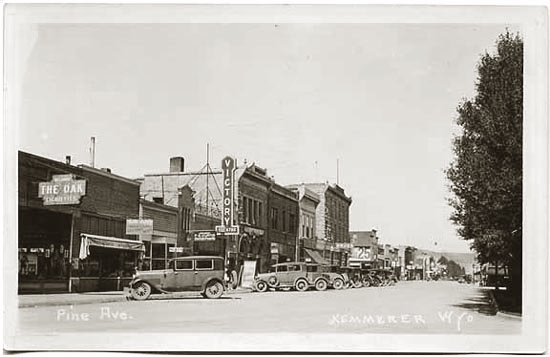 Kemmerer Hotel, 1923. Photo by Jackson Studios. Over the years the hotel fell into a state of decrepitude. The building, like some other buildings on the Triangle (as the Town Square is called) fell into disuse and its fine alder and marble bar found its way to Zion, Utah. Pine Avenue, looking toward Saphire, Kemmerer Hotel at end of block, Triangle on right. In 2004, plans were first announced for the construction of a new Victory Theatre with stadium seating and additional parking. The hotel was placed on the National Register of Historic Places. Over the years plans were considered for its adaptive reuse and the revitalization of the area around the Triangle. Unfortunately, in March 2004, the city engineer noticed that the stone work of the building had cracked and moved. Traffic was detoured and a portion of Pine and Saphire was closed. In June, 2004, the historic old hotel was pulled down and, thus, passed from the National Register. As of August, 2004, the Town Council had under consideration plans for the landscaping of the now vacant lot and plans for a revitilization of the Triangle by the reconstruction of the hotel as a civic center and the recreation of the facades along the Triangle.